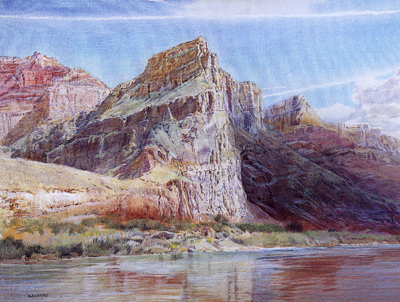 The evocative landscapes of the Southwest by Merrill Mahaffey seem bigger than life itself. There is a majesty and grandeur in the deep, sinuous canyons and sharp edged mesas of the plateau country, and a harsh and forbidding quality to the mountains and basins of the lower deserts. Everywhere there are vistas to behold and panoramas that unfold with each turn in the road. How does one capture this magnificence? The easiest way is to use a camera, but the lens can only behold a small portion of any given landscape, and film can never capture the true colors of this incredible land. 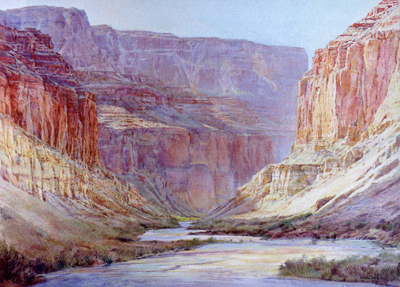 Only an artist can begin to interpret the beauty and drama of the Southwest, and through a brush put to canvas or paper can the glories of this corner of the world be brought to life. But how to portray such breathtaking scenery, that is the question. Photo-realism only duplicates what a camera can see, although with great painstaking talent such a style can truly live. Impressionism often misses the grit and feel of canyon walls or mountain crags. Merrill Mahaffey has found a way to present a form of abstracted realism that holds onto the power and boldness of the Southwest, but does not lose sight of the essence of light as it interplays with shadow, not of the drama of color. He considers himself to be an abstract artist because he is bringing forth the many shapes and textures of nature, taking from memory augmented by film the pure essence of what he has seen, but without all of the extemporaneous detail that would only serve to crowd out the true imagery of a given locale. Merrill Mahaffey's paintings are as dynamic as the landscape itself. Although he abstracts the essential essence from the actuality of the scene, there is still a significant amount of detail in his paintings to lend a strong third dimension, enabling the viewer to feel as if being drawn into the scene, providing a sense of actually being on site. This feeling of reality is one of the strongest draws to his paintings. Each tells a story about a locale, using the interplay between light and shadow and the brilliance of color to stir people's emotion. In all of his paintings there is a strong feeling of harmony between the colors of the palette that he has chosen. He believes in using one color key for each composition, just as a composer would use one musical key for a given symphonic work. In this way there is a great sense of balance, and his paintings do not exhibit tension between color values. Merrill Mahaffey was in New Mexico but raised in western Colorado. Inspired by his surroundings, he began to paint in his early teens. He received his Bachelor of Arts from Sacramento State College and then came to Arizona State University where he completed a Master of Fine Arts. He later studied with John Waddell and Harry Wood; distinguished Arizona artists that helped mold his artistic philosophy. The next 14-years were spent teaching art at Phoenix College until such time the he was able to earn his living by selling his paintings alone. Since 1980, Merrill Mahaffey has been exceptionally fortunate in developing a following for his art. His paintings hang in the Smithsonian Museum of American Art, the Phoenix Art Museum and the Metropolitan Museum of Art as well as many private and corporate collections. Today he works from his studio in central Phoenix, and spends much of his time out of doors, trekking across his beloved Southwestern land, gathering new subjects to be captured by his brush.